"You wait for a voice like that for a lifetime. You wait for a face like that, a smile like that, a presence like that, for a lifetime. When one person embodies it all, it takes your breath away." These were the words spoken by music producer Clive Days last Saturday, February 18 during the memorial of Whitney Houston. As the whole world knows by now, Houston died last February 11, breaking the hearts of family and friends and of her fans around the globe. Houston's ballad, I Will Always Love You, took people's breaths away. Listening to her sing, The Star Spangled Banner, stirred within the souls of Americans their love and pride for their country. Dancing to her song, I Just Wanna Dance With Somebody, provided everyone an occasion to let loose and just have fun. Whatever song she was singing, she knew which emotions needed to be tapped within her to make the song truly memorable. Some of the songs she made famous were not originally hers. But because she was a singer above the rest, she made those songs truly hers and hers alone. Houston owned the voice that many female and some male singers as well tried to match but with not much success. Even those who came close to her beautiful vocals were still not considered at par with her. She lived both a charmed life and one beset by challenges. Houston had so much more music and love to give but unfortunately, at the age of 48, her time on earth was cut short. The music that she left behind will be cherished forever by those whose hearts and souls she touched with her unbelievable golden voice. Whitney Elizabeth Houston was born on August 9, 1963 in Newark, New Jersey to John Russell Houston and Emily Houston. Houston's mother, who was well known by her nickname, Cissy, was not only a popular gospel singer during her time but also part of the female singing group called the Sweet Inspirations. The group used to perform backup vocals for the likes of Elvis Presley, Aretha Franklin, Lou Rawls and Dionne Warwick. Franklin is Houston's grandmother while Warwick is her aunt. Houston began signing at the New Hope Baptist Church at the age of 11. She often joined her mother on tours performing with her on a number of occasions. The young Houston did backup vocals for Chaka Khan, Jermaine Jackson and Lou Rawls. She tasted fame first as a model. Houston made the cover of Seventeen Magazine in November of 1981 at the age of 18. Other fashion magazines featured the African American beauty with the fantastic smile. Houston also did TV commercials. But she quickly grew tired of modeling and returned to her first love, singing. Houston played backup vocals to her Mom's cabaret act. When American record producer and music industry icon Clive Davis first heard Houston's singing voice in 1983, he immediately signed her up to Arista Records and the rest was history. Through the mentorship of Davis, Houston churned out hit after hit. She made 7 studio albums plus 3 movie soundtrack albums. All of her albums had gold, platinum, multi-platinum or diamond certification. Houston won countless music awards. She had 6 Grammy Awards, 22 American Music Awards, 30 Billboard Music Awards and 2 Emmy Awards to her name. Houston transitioned to films via the movie, The Bodyguard, opposite Kevin Costner. Costner was initially advised to star opposite a more established singer but he would not have it. He knew that Houston was perfect for the role and waited till she was ready to take on the project. Other movies followed like Waiting to Exhale, wherein she starred with three other female African American actors, and The Preacher's Wife, playing opposite Oscar winner Denzel Washington. Before she died, Houston finished filming the movie Sparkle opposite American Idol winner Jordin Sparks. Houston sang gospel, pop, dance, and R&B songs. Apart from being a singer, actress and model, Houston was also a songwriter, record producer and film producer. Her career spanned 35 years, from 1977 to 2012. Her personal life had its ups and downs. Houston, who was once married to singer Bobby Brown, battled alcoholism and drug addiction. Her career was greatly affected by her personal life. And, her once golden voice became dry and hoarse. Brown and Houston had a child together, Bobbi Kristina, who will be turning 19 in March. Houston, in her prime, was reported as having a wide vocal range, 5 octaves to be exact. Only a few singers can lay claim to such an outstanding ability. Some sources report that Mariah Carey and the late Minnie Riperton had the same range. Whether this claim is true about Whitney or not is not really relevant at this point. What is relevant is that Whitney will always be remembered as one of the greatest singers of all time. Houston's songs have been sung by millions of people, young and old, female and male, established artists, upcoming talents and fans from all walks of life. Many have done justice to her songs but no one can sing her classic Whitney songs with as much passion as her. The songs, I Will Always Love You, Saving All My Love for You, and The Greatest Love of All, can only be sung with perfection by Houston. In 1991, Houston sang the national anthem of the United States of America, the Star Spangled Banner, at the beginning of Super Bowl XXV. It will always be one of the best, if not the best, renditions of the national anthem ever. Last February 11, Houston was found dead, underwater, in the bathtub of her room in the Beverly Hills Hotel, in California. The real cause of Houston's demise is still unknown. The L.A. County Coroner's Office is awaiting the results of the toxicology report. The next few weeks will be tough for everyone who loved Houston; this includes her family, friends in and out of the music industry, and her loyal fans. The invitation-only memorial for Houston last Saturday, February 18, was held at Newark, New Jersey, in the church that she loved, the New Hope Baptist Church. Among those who lovingly performed for the late pop diva were Stevie Wonder, CeCe Winans, Alicia Keys, Kim Burrell and R. Kelly. Clive Davis, Kevin Costner, Dionne Warwick, BeBe Winans, Ricky Minor (Houston's music director) and Ray Watson (the singer's security guard for over 10 years) spoke during the memorial. Costner, Houston's leading man in The Bodyguard gave one of the most heartfelt eulogies. At one point he addressed Houston and said, "You weren't just pretty. You were as beautiful as a woman could be. And people just didn't like you, Whitney. They loved you." Houston's "home coming" lasted for 4 hours. She was finally laid to rest alongside her father in Fairview Cemetery, Westfield, New Jersey, on Sunday, February 19. Like the death of the King of Pop, Michael Jackson, Houston's death was felt deeply by members of the industry where she blossomed. She died on the eve of the greatest night of the music industry, the night before the 2012 Grammy Awards. Celebrities who walked the red carpet during the Grammys were asked how Houston's death affected them. All were saddened and praised Houston to no end. During the telecast itself, several artists paid tribute to Houston, some through their performances while others during their acceptance speeches. The most moving of all was Jennifer Hudson's tribute to Houston. Hudson beautifully performed, I Will Always Love You, while trying to keep her emotions in check. The night she died, Houston was supposed to attend the star-studded pre-Grammy party hosted by her mentor Clive Davis. The party went on as scheduled despite Houston's death that day. Davis talked about Houston's death and he said that she would have wanted the music to continue. He also said the Houston's family requested that the party go on as scheduled. Davis had only kind words for her during the pre-Grammy party (and also during her memorial that occurred days after). A number of African American female singers credit Houston for paving the way for other female black artists to enter mainstream music. She broke down barriers just like Michael Jackson did in the 80s. MTV showed her music videos, radio stations played her songs. Music fans embraced her because she could jump from pop, dance, ballads, gospel and R&B with so much ease. Houston was, without a doubt, a phenomenon, a singer with a voice to reckon with and to fall in love with. In singing contests across the globe, female singers often turn to Houston's songs to propel them to win. Her ballads are often chosen as competition pieces because Houston's songs like I Will Always Love You and Saving All My Love For You' are not easy to sing. Her songs can separate the singers from the singer-wannabes. Essence Magazine' dubbed her as the 5th Most Influential R&B Stars of All Time. Accomplished artists openly declare that Houston was a big influence on their careers. Some of these artists are Mariah Carey, Celine Dion, Toni Braxton, Christina Aguilera, Nelly Furtado, Jessica Simpson, Kelly Clarkson, Beyoncé, Destiny's Child, Alicia Keys, Ashanti, LeAnn Rimes, Jennifer Lopez, Leona Lewis, Rihanna, Jennifer Hudson and Lady Gaga. Many more female artists said that at the start of their careers, all they wanted to do was to sing like Houston. The very first time Tony Bennett heard the woman with the golden voice sing, he told Davis that he "finally found the greatest singer I've ever heard in my life." Mariah Carey was heartbroken and called Houston "one of the greatest voices to ever grace the earth." Oprah Winfrey said that to her Houston was "THE VOICE." The kind words and loving praises continue to this day from fellow musicians, music industry workers, celebrities, politicians, and those who simply enjoyed her voice. 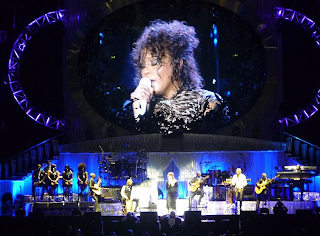 Whitney's music became part of a different kind of performance many miles away from the U.S. Her song, =I Will Always Love You, was featured in one of the Dubai Fountain shows. The Dubai Fountain is located outside the luxurious Dubai Mall. It is a hi-tech musical fountain featuring water jets that can shoot out water to up to 150 meters high while in sync with colored lights and music. Billed as today's largest water fountain in the world, this musical fountain is located in Burj Khalifa Lake in Dubai, United Arab Emirates. The Dubai Fountain follows in the footsteps of the majestic Bellagio Hotel's Musical Fountain in Las Vegas and the Magic Fountain of Montjuic in Barcelona, Spain. Each night, the Dubai Fountain features a multimedia show with dancing water, music, lights and other special effects. Since it's first show in May of 2009, different types of music from local and international artists have inspired fountain choreographers. Michael Jackson's 'Thriller,' Lionel Ritchie's 'All Night Long' and Celine Dion and Andrea Bocelli's 'The Prayer' were already featured in the past. Last 2010, Houston's most memorable hit, I Will Always Love You, played in the background while the water danced with the lights in sync. But it is only now after Houston's death that the water-based extravaganza, which was masterfully choreographed by a group of English College Dubai students, is being savored and enjoyed to the fullest by people around the world via YouTube and other social networking sites. The Dubai Fountain show is a one-of-a-kind tribute to Houston. There is no doubt that there will never be another Whitney Houston. Her soulful music broke language barriers because she had the unique ability to make people feel every emotion that she herself was feeling while singing her songs. Houston sang from deep down her heart. If her voice were an animal, it would be a butterfly because it floats effortlessly from note to note without missing a bit or losing an ounce of grace. It is truly sad that she left the world too early. Her voice, her grace, her beauty and her legacy will last forever. Technology will make sure that she is never forgotten and that her music will be known by generations to come. Whitney will be greatly missed. But she will also remembered with so much love and respect for the beautiful person and the true musical artist that she was.